Episode 56 of Radio Free Charleston, “DEVOBAMA Shirt” hail from November, 2008. This episode features searing hot rock from Dog Soldier, a really cool music video from The Button Flies, encore animation from Frank Panucci, and a trailer for the film “The Bride & The Grooms,” which was written and directed by Charleston native, Butch Maier. It’s hard to believe that it’s been more six years since we put this show together. Time flies, y’know. 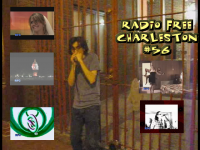 Check PopCult each week as we fill in the gaps of the missing episodes from Radio Free Charleston’s past. You can read the original production notes HERE.